This is a delightful disc and these recordings have been available for over 20 years. The opening theme of the Handel is a real joy, 'catchy' and very welcome. Marisa Robles captures the spirit if it to perfection and the larghetto is wonderfully controlled. François-Adrien Boieldieu is almost a forgotten composer. He was professor of piano at the Paris Conservatoire (1798 - 1809) and professor of composition there (1817 - 26). His opera Le Calife de Bagdad was a triumph in 1800 and an even greater success was La Dame Blanche of 1825 based on two novels by Sir Walter Scott, namely The Monastery and Guy Mannering. 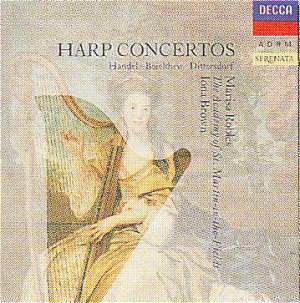 The Harp Concerto is attractive if not a great work and the performance has a marvellous elegance. Have you ever heard the 'Concerto for walrus and elephant' by Karl Ditters von Dittersdorf? Well, this isn't it. His Harp Concerto in A is a transcription of an unfinished harpsichord concerto of 1779. Dittersdorf was an equally fascinating composer. He composed 40 operas, 115 symphonies, 35 concertos, 30 piano concertos, 14 string quartets and so on. Sadly neglected and overshadowed by another Austrian composer named Mozart. The Harp Concerto is a really good piece in the galanterien style and, consequently, it abounds in elegance. And the picture on the cover is great, too!